Check utility depth for yourself. 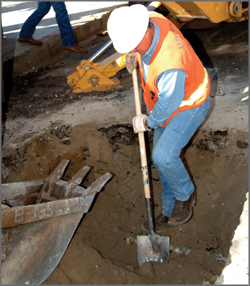 Before you can safely cross or work close to an underground utility, you must first verify its depth. Flags and locator marks tell you the direction the utility is running, but not how deeply it is buried. The only way to be sure of utility depth is to carefully expose it and see for yourself. Use a blunt-nosed shovel to loosen the soil, and a regular shovel to remove it. Do not use a pickax or a pointed spade. Do not stab at the soil or stomp on the shovel with both feet. Work with a gentle prying action and dig at an angle, so the shovel will slide along the surface of the wire, conduit, or pipe. Or, dig to the depth where you expect the utility to be, but off to the side. Then use a prying motion to break away soil as you approach the utility laterally. Use proper hand-digging tools and techniques to safely verify the depth of any buried utilities you must cross or work near.